Success is being seen in the early days of Lakefront Utilities’ new Mobile Application. Working with Screaming Power the app helps customers better connect with Lakefront through mobile engagement including notifications and information sharing. Adam Giddings, Manager of Regulatory Compliance and Finance described how the app has improved communications with the customer through more real time interaction, you can’t get from a website or a phone message. The outage notification system will be helpful for Lakefront to avoid the manual door to door notification process when planned maintenance outages are required as mobility allows for notification even when the customer is not at home. For emergencies, it will helps send messages outbound saving time when internally managing incoming calls and properly informing the community of rapidly changing environments. For the customer accessing billing and usage data on their mobile device is quite beneficial. The application allows for a quick and easy process to view a summary of their historical usage versus looking up old bills. 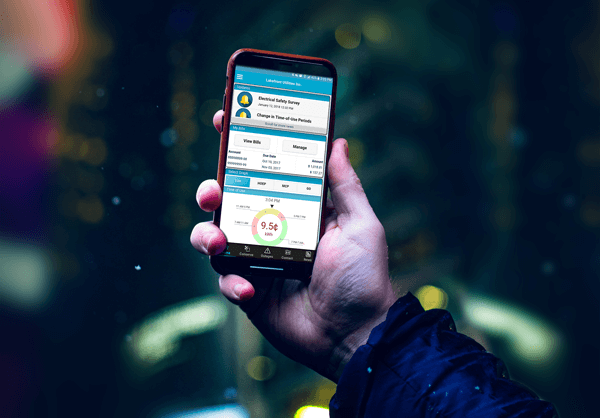 The Conservation & Demand Management (CDM) program in the app is helpful for the customer as it educates them on saving energy and even assist with the mapping of locations of active retailers. What was also helpful was Screaming Power’s pricing arrangement so the utility can decrease cost with customer uptake of the App. For Lakefront, there is a tangible dollar savings related to staff hours and process improvements that is just starting to be realized. This savings is a win for everyone. Regarding the upcoming Green Button initiative Giddings feels better prepared with the Screaming Power App up and running as they have a better understanding of how they can use mobility and data to engage their customer and the solution itself is already configured to manage data such as the GB format. This will save time and money for lakefront. Giddings recognizes that early preparation and gap analysis can better prepare LDCs for policy and procedural change, some of which is mandated by the Ontario Energy Board. (OEB). While all projects compete for available budget capital a proactive plan helps manage costs and better position the LDCs for operational success.